Explanation: Gravitational radiation has been directly detected. The first-ever detection was made by both facilities of the Laser Interferometer Gravitational-Wave Observatory (LIGO) in Washington and Louisiana simultaneously last September. After numerous consistency checks, the resulting 5-sigma discovery was published today. The measured gravitational waves match those expected from two large black holes merging after a death spiral in a distant galaxy, with the resulting new black hole momentarily vibrating in a rapid ringdown. A phenomenon predicted by Einstein, the historic discovery confirms a cornerstone of humanity's understanding of gravity and basic physics. It is also the most direct detection of black holes ever. 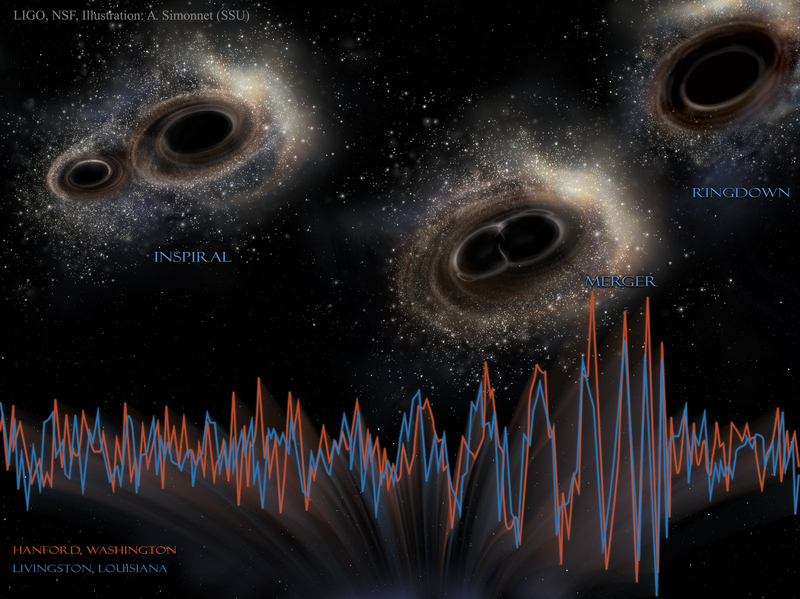 The featured illustration depicts the two merging black holes with the signal strength of the two detectors over 0.3 seconds superimposed across the bottom. Expected future detections by Advanced LIGO and other gravitational wave detectors may not only confirm the spectacular nature of this measurement but hold tremendous promise of giving humanity a new way to see and explore our universe.